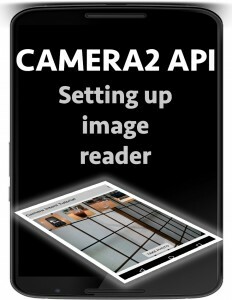 Setting up the android camera2 api ImageReader for capturing a still image. This tutorial describes setting up the android camera2 api image reader which provides the surface for capturing a still image. In the takePhoto method assign a new File to the Activity file. In the setupCamera method calculate the size of the largest image the camera can capture. Then create a new instance for the ImageReader using the calculated size, then enable the ImageReader’s setOnImageAvailableListener callback.